Philippines officials: 10,000 dead, 800K missing, and major urban centers flattened by raging storm. Philippines police forces announced Sunday that the death toll from Typhoon Heiyan is estimated to be over 10,000 people, with an additional 800,000 reported missing - far over initial estimates earlier this week, which were at 1,200. Typhoon Heiyan, which hit the Philippines Friday morning, is reportedly considered to be among the most powerful in recorded history. The wreckage isn't over: the typhoon is estimated to be continuing its path of destruction along the direction of Vietnam. In some towns - such as coastal city Layte, where the typhoon reportedly hit first Friday morning - the raging currents have reportedly flattened between 70%-80% of its land in its entirety, a senior police official stated. The official also reported that between 300-400 bodies have been found in the wreckage of major cities. The Philippines Interior Minister stated that the typhoon has washed away "all traces of modern life" in many major urban centers and that police forces are having difficulty establishing the status of the residents of several regions at the moment. 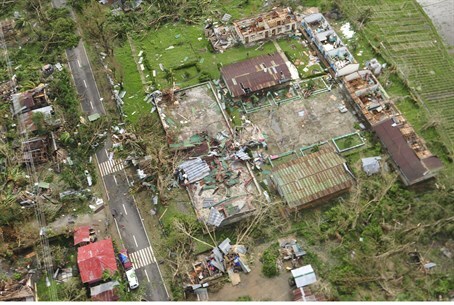 Philippines president Benino Aquino III, has asked for aid from the international community in the wake of the typhoon. The US Defense Department has already offered aid, including helicopters, ships, and search and rescue equipment, according to US Secretary of Defense Chuck Hagel.